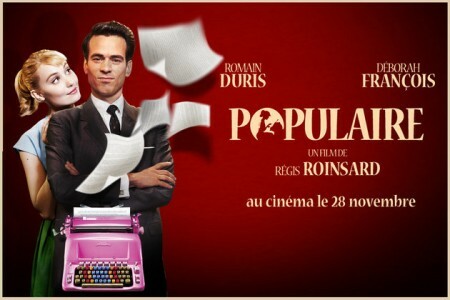 If you like Almodóvar circa Women on the Verge of a Nervous Breakdown, the ‘Think Pink’ number in Funny Face, 1950s clothes, cha-cha music, the look of Doris Day/ Rock Hudson movies, or ironic romances laced with a dash of camp, you’re likely to find Populaire charming . It’s a relief to see a pretty romantic comedy that doesn’t assume its audience is moronic. However, this is a film where the heroine’s idea of romance and adventure is to simply find Mr. Right; so the sexual politics of the film can at times seem as retro as its chic. It might be best to approach Populaire with the same amused, affectionate and ironic sense of wonder with which the film itself presents its characters and its world. That said, Populaire is a sustained achievement in that most difficult of elements to get right – tone: light, buoyant, gurgling with glamour but morally girdled. The effect is as if Samantha from Bewitched had twinkled her little nose at Don Draper, squeezed all the sourness out of him, and found him a princess who could type. Romain Duris and Déborah François play the couple as if the only thing blocking their waft towards a billowy nest of love is their (gentle) butting of heads. The typing contest, filmed like a gunfight at the ok corral if the ok corral were a gleaming art deco hall, is a joy. The whole lovely confection is directed with great precision and crack timing by Régis Roinsard.